To celebrate Imperial Car Supermarkets’ partnership with Northampton Town FC, we are pleased to announce a fantastic competition where you can join us and The Cobblers at Sixfields for the Notts County game on 2nd April 2016. To enter all you need to do is find Imperial Car Supermarket on Facebook and send us a direct message with your best guess for the stadium attendance for the Newport County game which takes place on March 25th. 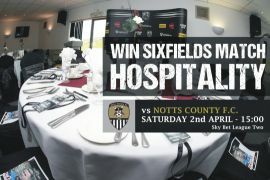 The three entries closest to the actual attendance will (along with a friend of their choice) be our guests at the Notts County game on the 2nd April 2016 at Sixfields. Closing date for entries is the 24th March 2016 - Good Luck! Imperial Car Supermarkets has used car showrooms in Southampton, Portsmouth, Chertsey, Swanwick, Fleet and Northampton. We specialise in selling top quality, RAC inspected, used cars from Audi and BMW to Mercedes-Benz, Jaguar and Volkswagen. Imperial Cars - We’re Miles Better!